which is the best axe for carving, bushcraft, general use? : "I get asked this question a lot so thought it would be good to make a blog post which I can refer folk back to. 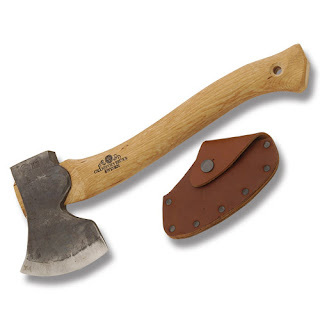 In the world of Bushcraft most folk go for the Gransfors Bruks small forest axe, it is recommended by Ray Mears which no doubt helps it's popularity, it is like Rays bushcraft knife, a bit of a 'jack of all trades, master of none' compromise and I personally think there are better options. 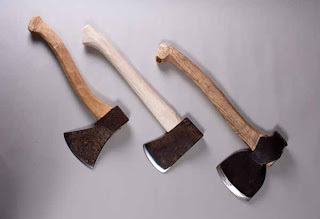 Axes always tended to be designed for use two handed and have long (around 30-33') handles or one handed use and have short (around 14-16') handles. One handed axes are often called hatchets whilst the longer handled axes of various designs were for felling, limbing and splitting. The Small forest axe is sort of between these at 19' so you can just about use it two handed though it never feels right or you can use it one handed but the long handle stops it pivoting nicely when held close to the head and used for the sort of controlled carving that I do a lot of. If I were to only have one axe (a terrible thought) it would be a Gransfors Bruks Swedish carving axe. This axe was designed by Wille Sundqvist the Swedish mastercraftsman who first inspired me in my work and it is specifically designed for one handed carving. It will do everything though. It will fell a tree at a pinch and split it into firewood but if you do a lot of that I would strongly recommend an axe with a 30-33' handle. This one excels at carving objects with curved surfaces like spoons but is also very good at hewing flat surfaces to make beams, given time and a woodland it would be possible to build a house and it's contents with this axe. It has 3 drawbacks, first it is expensive at around £80, second it needs someone with reasonable forearm strength to use it properly and they don't make a lighter version and third whilst Wille designed it to have a slightly longer bevel on the left side to help control carving and they used to come that way it now comes either completely flat on the left like a side axe or with an even bevel. Out of the two I would favour the even beveled one as the flat sided one tends to dig in a little and be more difficult to carve concave areas. Another axe from the Gransfors stable that I rate highly is the wildlife hatchet, these are quite good value at around £50 the handle is 14' same as the carving axe but the head is around half the weight at about 1lb. Anyone can use this axe and it is the only axe I would consider carrying in a backpack. Again it would be possible to fell and limb a tree with this axe though it is perfect for light carving work, such as spoons or tent pegs. When choosing an axe I suggest you use the heaviest axe you can carve with for 20 minutes or so without getting at all tired. If you can manage a heavier axe the weight will do the work and you don't have to swing as much but a lighter axe moves more quickly and lots of small cuts remove wood just as a few large ones do. This is sounding a little like an advert for Gransfors Bruks. I do like their axes and the beauty of them is they come sharp and ready to use and with a sheath to keep them sharp. There are many much cheaper axes that work very well but I have yet to find one that is cheap and comes well sharpened for carving. One of my favourite cheap axes was sold for a while by Argos and reduced for a while to less than £5. I imagine most of these cheap axes are made in China but all that I have tried have been good steel and well tempered, they have all however come very blunt, not just needing a sharpen but some major grinding work to get them working properly so I tend not to recommend them unless you have a power grinder and know how to reprofile one. Searching the web for the best deals today this Bahco axe looks about perfect, an 800gm head on a 14' handle. Another nice option is to look round your local car boot fair and buy an old axe. All our grandparents generation had hand hatchets for splitting kindling, at boot fairs they tend to have loose handles and be completely blunt so need a new handle and a regrind but it is a joyful job to bring one of these old axes back to life. Here are a few typical ones. This is the sort of carving I tend to do with axes, the axe does matter but correct technique is much more important. Video currently without sound but still shows the techniques.